Below is Flight Plan by artist Michael David Murphy. Twenty five different ball flight sequences of eleven different golfers, all on one major championship afternoon and masterfully timed gives you Flight Plan. So close yet so far away! In association with Adidas Golf, the below jaw-dropping 3D anamorphic pavement art was painted by Joe Hill at last year’s Barclays PGA Tour. To add more spice, Sergio Garcia was present as a little promotion for adidas, preparing to “chip” out of a “bunker” at a “hole”. The painting reminds us of the Xtreme 19th hole in the Legend Golf, South Africa. But definitely an amazing one! Following up on our Every Shot Imaginable post, the European Tour has come out with a new promo video, this time defending Scotland against imaginary pirates. Every play “hit the target” on the golf range? Well, it’s a bit like that, except you are aiming for the 3 foot mouth of a barrel, bobbing in a dinghy 150+ yards out to sea in high winds. How To Get Masters Tickets? “Having tickets to The Masters is the best dowry a wife could have in the South.” Those were the exact words exchanged in a brief conversation I had with a young lady late last week. She’s right – as of 2000, there is no direct way to get Masters badges to the tournament. That said, with the tournament coming up next month (April 2-8, 2012) there are some indirect ways to get a hold of tickets and experience the Tournament. Ten years ago, patrons would get their individual daily badges for Thursday, Friday, Saturday, and Sunday. 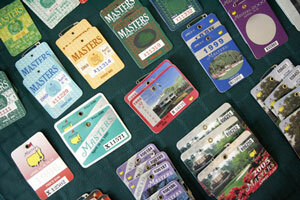 Most of the badges were used by those who originally go them, however too many were traded, exchanged, and sold online. As a result, members began to crack down on this abuse of the system by adapting to the times. First, they created a single tournament badge. This cut down on the exchange significantly because if you sold your badge for Thursday it was gone for the rest of the week — unless you knew the person using it and they gave it back to you. Further, if you sold your badge to someone who acted inappropriately on the grounds, their (i.e. your) badges would be taken away and you would not receive another one come this time next year.